Winter, especially winter in New England, can be hard on your lawn. Frost, freezing rain, ice, and plenty of snow can cause damage to your lawn by freezing, flooding, and smothering. However, grass is a resilient thing. With a little bit of work, you can prepare your lawn to ride out winter and be even lusher in spring. Throughout the fall and even into early winter, there are several options available for lawn care in winter. Today we’re going to talk about dormant seeding. Perennial plants like grasses go dormant during the winter months, allows them to survive for long times under banks of snow and little sunlight. Likewise seeds of this grass also go into a dormant state once the ambient temperature drops down (usually below 50 degrees Fahrenheit). Once they will reach this dormant state is when the proper grass seed is selected and mixed into the existing grass. Timing is key, as you need to seed before the snows come in, but after temperatures hit this critical low. If there is a mild patch or a sudden spike in temperatures, the seeds will start the germinate, and then die when the next freeze comes in. Timing is critical, as well as making sure the thatch is clear to have seed-to-soil contact. 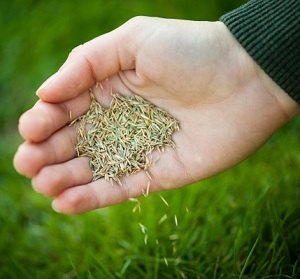 Overseeding is a general concept of spreading grass seed over an existing lawn to promote thicker growth as well as fill in struggling or dead patches in a lawn. While that is a commonality between both dormant seeding and overseeding, it’s the timing and intentions that are different. Overseeding is done in spring or early fall during the warm seasons to promote quick grass seed germination and growth before the growth slows down and halts in winter. Dormant seeding picks up after this critical point to take advantage of the dormant state and prep the lawn for the next growth period. Fertilize Your Lawn: During the cool grass seasons of the fall, winter, and early spring, it’s important to keep your lawn fed until temperatures and sunlight get back up. Mow and Clear Your Lawn: In the months leading up to the hibernation of your grass, make sure to start mowing your grass lower and clear your lawn of debris. This will prevent animals from nesting (and destroying) your lawn. Keep Traffic Off the Lawn: Foot traffic on the lawn, especially frosted and snow-covered lawns, can wear a path. Make sure to clear and use walkways, and avoiding exposing the lawn to salt where possible. Also, if you have a sprinkler system, it’s important to properly winterize the system to avoid costly repairs (and digging up the lawn) later. Read more about it – How To: Preparing Sprinklers for Winter. At Greener Horizon, we provide expert Lawn Care and so much more. From full season maintenance packages to complete landscaping and hardscaping services, contact us to learn more.